National Football League preseason games start this week but I have a beef with this league that needs to be addressed. Whose with me? This league uses up and spits our some of our finest men each and every week. Yet, the owners feel they are moral gods that control how their players should act of react. I still see a few posts showing up on my timeline about boycotting the National Football League because Colin Kaepernick hasn't been signed to a contract for the upcoming season. Not many posts but a still a few that indicates people understand the lack of community consciousness that the owners of the National Football League team display when that singular black man decides to take a stand against injustice. In this case, Colin Kaepernick, who decided to kneel during the playing of the National Anthem to illuminate the level of police brutality that exists within the black communities across this nation. Colin simply kneeled, he didn't burn the flag, nor did he agitate for violent mass demonstrations in the streets of America, nor did Colin Kaepernick call for financial boycotts. He simply, silently kneeled and that singular defiant peaceful action shook the entire patriotic value system of a league based on a game centered around an oblong shaped pigskin and violent human collisions. Colin Kaepernick didn't do any less than any other conscious patriot would do in a situation where one's basic human rights were being threatened. Of course, he could've simply ignored the rancor surrounding these acts of injustice involving law enforcement and the community that they are sworn to protect. Colin could've simply closed his eyes and continued to pick up his million checks and play the game. Yet, supposedly, doesn't this country build its prestige and honor system on the right of the individual to protest through action and speech any act of injustice? What exactly did Mr. Kaepernick threaten that caused some much media outrage against his simple stance of that act of kneeling? Why did Stephan A. Smith speak out against the action as if Colin Kaepernick had savaged the song and the nation? 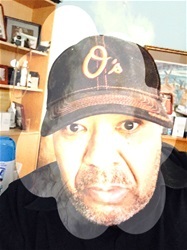 What about that other league lip Jason Whitlock, whose distaste for Colin Kaepernick is so obvious it's simply distasteful to even view the brother open his mouth sometimes. Come on now y'all he simply kneeled. How many times have we seen injustice on our television screens, or even in public and turned a blind eye? Is that reason being that injustice is what such a common occurrence in our society today? Why did he kneel should be the question asked? Was the act of kneeling justifiable? Did his act send a meaningful message to those whose silence allows such acts to continue with prosecution? You see in America we have this thing called the “bully pulpit”. The bully pulpit if used effectively can call attention to injustice to the degree that it enlightens those who need to be enlightened. Colin Kaepernick is an educated black man, committed to meeting objectives, sincere in thought and dedicated in purpose. He must have these elements within his personality to succeed as a quarterback on the field of play. The position of quarterback is said to be the most complex of positions in the game. He’s defined as a leader and must be respected as a leader both on and off the field. So, when Colin Kaepernick kneeled he was showing maximum leadership skills. He was telling those who looked towards him for leadership that he consciousness extends beyond the field of play. That is what we want in leaders I would think. Now, he didn’t get all of his teammates to follow him in his effort but he showed his courage by direct demonstrative action. A simple kneel, now he is unsigned, seemingly unwanted, in a league that has been accused of many negative acts against both players and fans. Isn’t this the league that hide the dangers of violent brain trauma? Isn’t this the league that locked out players and fans because they didn’t want to share an equitable portion of revenue derived from this violent game? Isn’t this the league that wants our attention 24/7 , 365 days a year? Isn’t this league that pushes erectile dysfunction commercial on the regular along with drinking beer knowing that many of the audiences are young and impressionable? Isn’t this league where they want to milk every available dollar out of the public? Isn’t this the league which partners with gambling establishments to show point spreads each and every week including preseason games? Isn’t this the league that has turned a blind eye to the illegal and criminal acts of some of it’s star players? 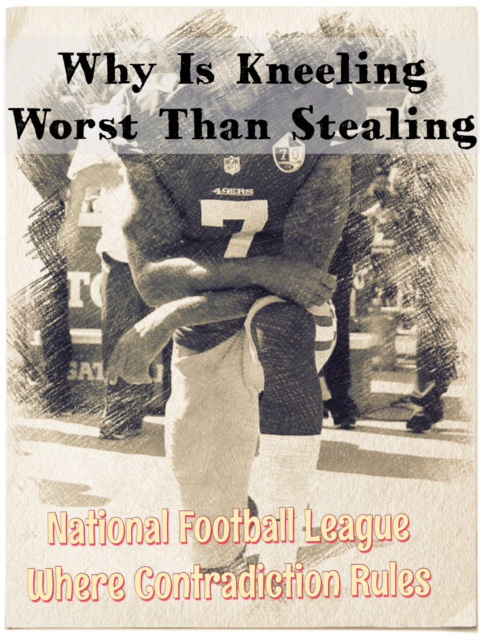 Many of these marketing strategies can be perceived as intentionally stealing, so tell me how in the world is kneeling worst than stealing.